I had one of these beers in the beer fridge for a while. I recently drank it and thinking that I had already reviewed it I did not review it at the time. Last Friday night Bill Moore from Lancaster Brewing was at State Line Liquors for a tasting. I had this beer again that night and thought it was worth another review. After I got home I realized that I had never reviewed it; all this time I had this beer confused with Stoudts Oktoberfest. I bought a 6 pack of this beer and used several bottles to slow cook Kielbasa and Sauerkraut. It really turned out great, maybe I’ll talk about that at on a different post. This time I made sure to keep one to review. So here it is. The beer pours a clear copper with amber hues and an off white head. This is also as a fair amount of carbonation with lots of tiny bubbles rising up from the bottom of the glass. The nose of this beer reaches you as you are pouring it. Rich caramel almost toasted malts and light hop aromas are on the nose of this beer. This is just a wonderful nose; extremely inviting. I can’t wait to dive into this. 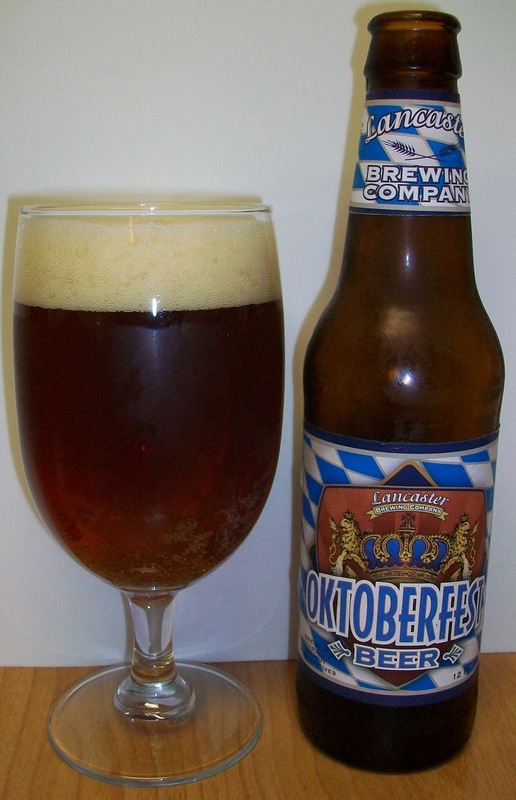 Wow, this is a nice clean and refreshing Oktoberfest. It may not be as full bodied as some of the German counterparts but even from the first sip I can tell you that this is good. The taste starts out with sweet light malts up front on the tip of the tongue followed by a very pleasant effervescence in mid-sip. The mid-sip carbonation adds to the refreshing aspect of this beer. The back-end is extremely easy drinking again with a substantial carbonation release during the swallow that masks some of the malt flavors. The malt flavors start to come through toward the end of the swallow through the finish. There are nice fairly rich malt flavors, caramel almost toasted malts. There are also light hops on the finish, just enough to dry without bittering. There is not much of a lingering aftertaste just a pleasant hint of these nice malt flavors. We are now at 56 degrees. As this beer warms the malt flavors are getting robust. The beer is not picking up any off flavors, the malts are just more pronounced now. I’m really impressed with this beer. Well, maybe impressed isn’t quite right but I am pleasantly surprised how good this is. This may be one of the best American versions of this style. Well, that was the last sip, almost at room temperature and still very refreshing. I am always impressed when a beer taste this good as it warms. This is a solid B maybe even a B+. It may not be as full bodied as some of the German Oktoberfest but it ranks up there as one of the best American renditions of this German Classic.